Apple removed the option to buy an AT&T iPhone on a two-year contract from its online store on Thursday night, reflecting AT&T's wider shift away from two-year contracts. 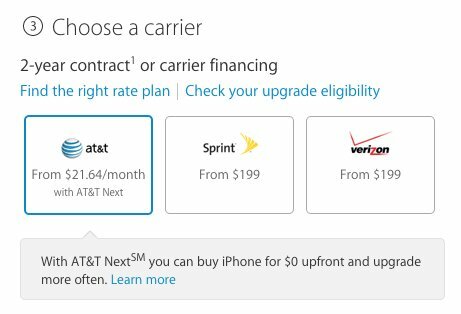 Shoppers wanting to go with AT&T at the Apple Online Store must instead pick up an iPhone through Next, the carrier's upgrade program. Although there's no required down payment, Next customers must make monthly payments for 12, 18, or 24 months on top of the cost of a voice and data plan. A 16-gigabyte iPhone 6, for instance, starts at $21.64 a month. The lowest rate for a 128-gigabyte 6 Plus is $31.64. People wanting to avoid Next can still do so by buying an unlocked phone, or by going through AT&T's website or retail stores, where the older pricing scheme is still an option, if no longer the default. Rival carriers Sprint and Verizon are continuing to offer subsidized contracts through Apple, despite having their own upgrade programs. Apple is only offering T-Mobile models at full unlocked price or through the carrier's Jump upgrade plan. Two-year iPhone contracts have typically required carriers to pay high subsidies, sometimes to the point of losing money on the hardware in the hope of recouping the cost through service fees.